2014 Wisconsin Innovation Award for the VitaCycle project. 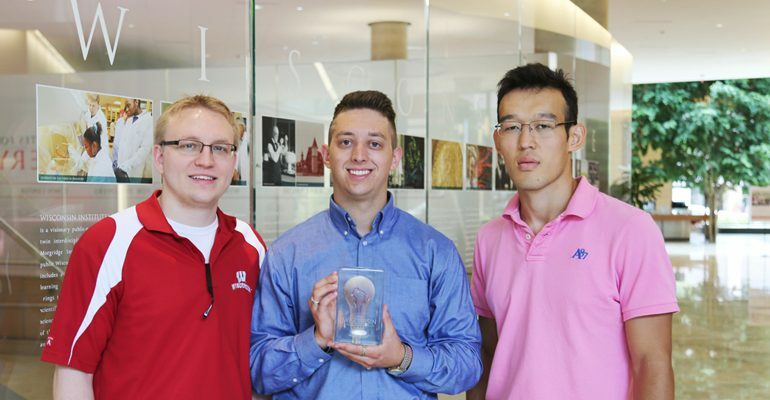 A team of University of Wisconsin-Madison students won the 2014 Wisconsin Innovation Award for VitaCycle, a system for growing and distributing these microgreens. 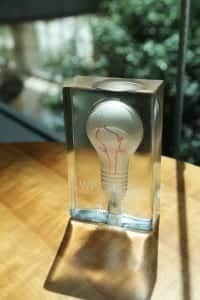 Ten projects from Wisconsin innovators were honored from a pool of about 150 submissions. The current VitaCycle module fits three stacked trays of microgreens in a bin sized for a standard bicycle trailer. Particularly in urban settings, this makes for an easy, low-emission distribution system. Growing microgreens has several benefits—they use less water overall, contain high nutrient density, and have a fast cycle from seed to harvest—but VitaCycle most takes advantage of their ability to germinate without light. The microgreens can begin the growth cycle in darkness, only needing light the last three to four days to push out of the soil. The VitaCycle tray system allows for growing the plants vertically in stacks; the top stack takes advantage of the sunlight to sprout, while the lower stacks are in the earlier stages of growth in the dark. Producers can harvest and rotate the trays around as necessary. Plants like sunflower and pea shoots can be grown and harvested as microgreens, and they are most commonly used as salad additives or in juice and smoothie form. The immediate future for VitaCycle includes establishing a growing center in Madison, Wis., as well as preparing for the 2017 World’s Fair in Kazakhstan. The VitaCycle team was recognized earlier this year with a first-place win in the Expo Village 2017: Innovation in Energy Efficiency and Saving competition. The team proposed a green roof installation of microgreens for the village at the 2017 World’s Fair, and the competition win comes with the chance to implement the proposal.